I have been working on the Spring 2018 issue of Cast On. What a lot of work! This issue has been quite frustrating to work on due to the havoc the weather has played on postal and UPS deliveries. I pushed the photo shoot back a week in hopes that a few more items would arrive. Alas, I am still waiting. The process of uploading the WORD files after our tech editor, Sharon, gets them to me can take a long time. I spent over 6 hours on one technical article but it will be well worth it to our readers. That is an explanation of why I don't have much listed under my current projects. If I am at home, I am sitting at the computer with my dear friend (and enemy) WordPress. We got great news this week at Masters Day at the DFW Fiber Festival is sold out! We are testing the idea out of piggy backing on fiber festivals since we are not going to do full blown conferences again. I haven't posted a photo of George and Petipa for quite some time. This photograph documents a rare occurrence. They never are this close together. 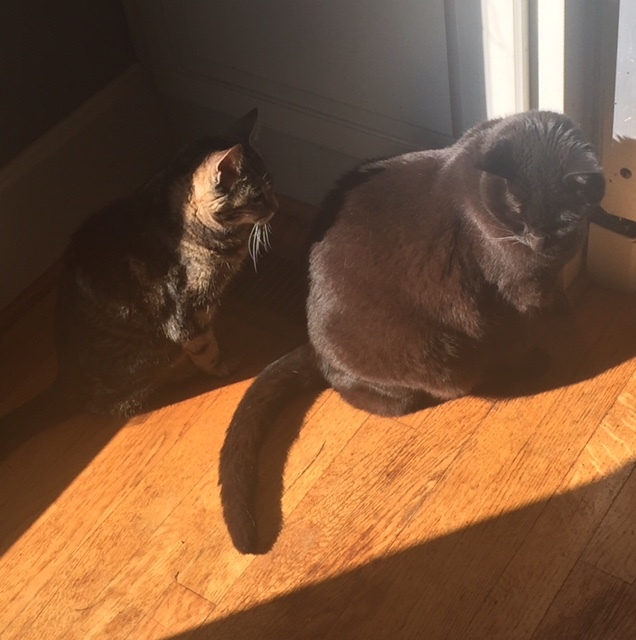 They are sharing the sun near a heat register since the temperature is in the teens. I've had several students finish up the Basics course. It always makes me happy to see them complete the course. Once I get Cast On out of the way, I'm going to look at the course and make some revisions. It's been quite a few years since I've updated it. This week's tip is prompted by what I have seen in several of the Lesson 3 work of the Basics class which discusses how to measure gauge. No, you don't knit 10 stitches and then get out the oldest tape measure you have and count the stitches. I've done several blog entries on how to measure gauge (look at Gauge in the Index and you can find them) but since several students had this issue I decided to do a special post on the topic. Now notice how the "smiles" and "frowns" interlock to make a ridge. Several of my students have counted the ridges for their gauge. It takes two rows to make a ridge as the photo below shows where I have stretched the garter stitch. Now onto seed stitch. I've had a couple of students recently count the only the purl bumps for their gauge calculations. If you look close you can see that there is a knit stitch at the top of the purl bump which is hard to see but it is there. Yes, you can count the purl bumps for your row count by multiplying that number by 2. Take care when you measure that you include the knit stitch on top of that purl bump or subtract one from the row count. I've numbered the rows below. When you are calculating gauge, it will only be as accurate as your measurement and the number of stitches/rows. If you get any of those wrong, you gauge won't be accurate. As I said above, I haven't spent much time knitting. I did manage to finish all of the texting gloves..4 pairs total. I love the gloves but finishing is such a PAIN. All those ends to weave in. My dear sweet blind Petipa is guarding the last pair. What really made me happy is that I used yarn I had in my stash for all of them. They were all worked in Zen Garden yarn I picked up at TNNA several years ago.